President Barack Obama on Sunday seemed to walk back his administration's previous statements acknowledging the Muslim Brotherhood should have a voice in shaping any successive Egyptian government. During a pre-Super Bowl interview on Fox, the president called the Brotherhood "one faction in Egypt," but said that the country's future is greater than a choice between the existing Mubarak government and the Islamists. "There is no single way forward," State Department spokesman P.J. Crowley said, echoing the president. The Brotherhood disagrees, increasingly issuing demands as the calls for Mubarak's immediate ouster continue. Because it is the most organized opposition group, the Brotherhood is well positioned to influence Egypt's future. And that influence is likely to stand against American interests. As such, American officials should make our policies and interests clear and identify our allies and our enemies, writes Bill Siegel at Family Security Matters. "Although many choose to look the other way, The Brotherhood in Egypt makes no effort to disguise its position that America is its enemy (in addition to despotic rulers in Arab lands and Israel) or that it seeks the destruction of America as it is," Siegel writes. "In any other context, our leadership would have no difficulty in identifying the Brotherhood as our enemy." That won't be easy for an administration that has advocated outreach to Islamists as a centerpiece of its foreign policy. After inviting Brotherhood officials to his 2009 Cairo speech, the president "will have to ultimately identify the Brotherhood as our enemy," Siegel writes. "Yet, in doing so, he will then have to reverse the course of action he has taken domestically. More importantly, he will be forced to take strong actions against the Brotherhood here." Efforts to court the Brotherhood are not new, however, as Ian Johnson details in the New York Review of Books. Where previous interaction turned out to be futile attempts to sway the Islamist groups to view America more favorably, conditions emerging in Egypt may leave little choice today. Johnson, author of A Mosque in Munich, traces efforts from Dwight Eisenhower to George W. Bush to woo the Brotherhood. It continues today. "Most—including the Obama administration —seem to think that it is a movement the West can do business with, even if the White House denies formal contacts." This approach ignores the movement's slippery political positioning. "In countries where it aspires to join the political mainstream, it renounces the use of violence locally," Johnson writes. 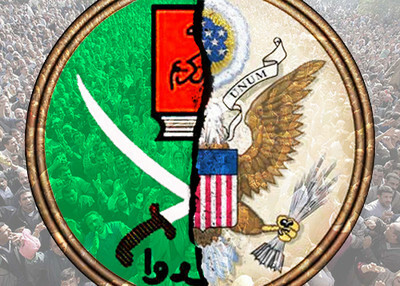 "Hence the Muslim Brotherhood in Egypt says it no longer seeks to overthrow the regime violently—although its members there think nothing of calling for Israel's destruction. In Egypt, the Brotherhood also says it wants religious courts to enforce shariah, but at times has also said that secular courts could have final say. This isn't to suggest that its moderation is just for show, but it's fair to say that the Brotherhood has only partially embraced the values of democracy and pluralism." The debate makes it easy to overlook the aspirations of those who started this peaceful revolt. There is little indication that the protestors want to see the authoritarian, repressive Mubarak regime replaced by a government which, at a minimum, is significantly influenced by authoritarian and repressive religious fundamentalists. Writer Alexander Meleagrou-Hitchens republished a Facebook posting of one protestor, who described the jihadist chants of Islamists trying to organize in the crowd. "NO!" the anonymous poster wrote. "This is NOT why we were in the streets on Friday being tear gassed and dodging rubber bullets and it is not why we have been going to Tahrir everyday to be heard. The reason why this revolt went through and became successful was because it was not religiously or politically charged. Don't let the ones who have been watching this unfold in the shadows ride this wave and hijack what you have been fighting for."